A thousand years ago Last year, I got a DM from a random Earper asking about FanExpo. Wynonna Earp was my first fandom, and Office (AKA Jill) was one of my first Earper friends. We both fangirled over the show, the actors, and over our personal favorite, showrunner Evelyn Andrews. 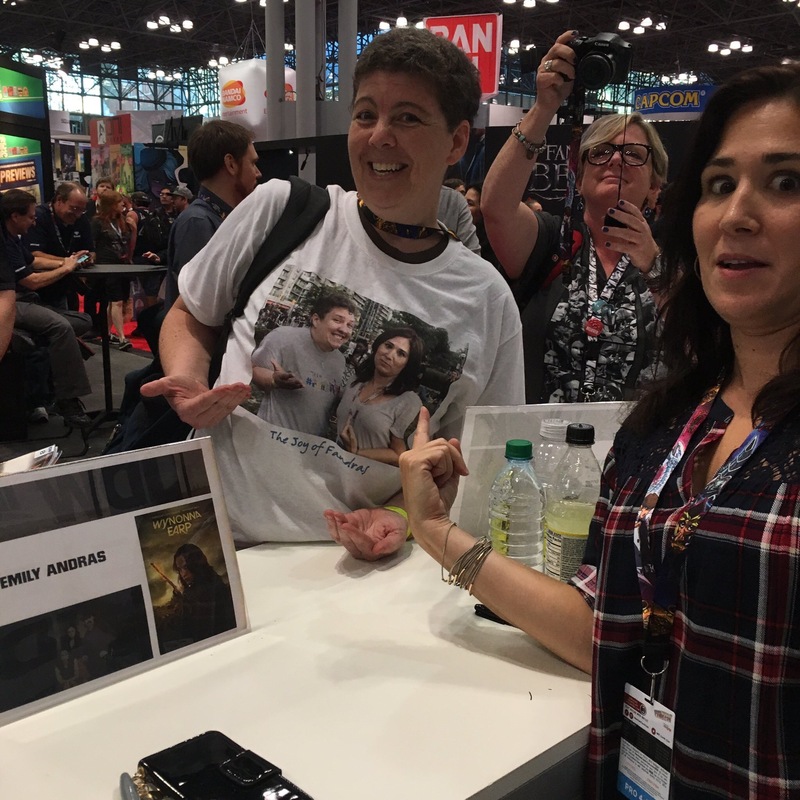 We met in person waiting in line to meet the cast and Evelyn, and then, on zero sleep, she got back in her car and drove to Rochester. I had offered to let her sleep on the couch of our AirBNB in Toronto after she assured me that she was not a lesbian serial killer — neither a lesbian who killed people, nor a person who killed lesbians — but she insisted on driving through. A friendship was formed that day that I will always treasure. She asked if she could steal my Fandras picture to create a Fandras inception, and I obviously said yes. Tim Rozon snapped this picture, and it’s one of my favorites. Interestingly, people then confused the two of us, thinking Nedley’s Office and old Lesbiyinzer here were the same person, and that is not true. We are two separate people. However, as I found at ClexaCon, I would be lucky to be confused with Jill, who is the very essence of an Earper and a true representative of the best of our fandom. I am thrilled to have met her and honored to call her a friend. I’m an aerodynamics engineer by education, a software technical project manager by trade. I love distance bicycling (my longest ride is 150 miles in a day and have my eye on doing 200 miles in a day next summer or the one after). Raised in Ann Arbor, I’m a Michigan Wolverine through and through but now live in NYC – I moved here intending to stay just one year to experience city life. That was 11 years ago. I go on at least one one-week vacation with my mom & dad every year because they are two of my best friends as well as my parents. Obviously, another significant personality trait of mine is that I love to fangirl. A friend of mine after Ep1 aired messaged me and said, “Jiiiiiiiilllllll!!! Wynonna Earp. That is all.” (I think that was the exact quote.) After Ep2, she said, “JIIIIIIIIIIIILLLLLLLLLLLLLLLL! WYNONNA EARP!!!! TRUST ME!” I had recorded Ep2 but hadn’t watched it so I watched it and was all, “Oh, hello.” Then went back and watched Ep1 and was hooked. It wasn’t until Ep9 that I decided to jump into the Inanimate Object twitter handle mayhem and then the rest, as they say, is history. Awww, part of me wishes it was, but part of me is happy it’s actually not. Star Trek was my first fandom (as in the original series, though I was not alive when it aired, I loved it and yes, I’m a Trekkie). The X-Files was my second fandom; I cut my teeth in that fandom at the same time the internet was being born. Yes, I know that’s dating myself. BTW, I was totally a noromo, don’t flame me. I have two. My friends and I took a trip to Vancouver to seek out and take the geekiest of geeky pictures with X-Files locations. During that trip one of my buds and I arranged to meet with William B. Davis (aka the Cigarette Smoking Man in X-Files). To our surprise, during that meeting he asked us out to lunch! That lunch was just…. beyond expectations. Okay, so the above FanExpo 2016 was my first real con and as such, that memory is my fave. Second favorite is the two #FandrasInceptions I’ve been an honor to be a part of. Oh, and I did get a hug from Kat Barrell at ClexaCon and how can I not mention that?!? This might come as a surprise to a lot of people, but I enjoy writing fake small-demon-infested-town police blotters and fictional goings on in the sheriff’s office. I have always had a strange adoration with small town police blotters (probably because my mom was born in a tiny town in the thumb of Michigan [and kudos if you know what ‘the thumb of Michigan’ means]) and this just kinda fed right into that. It’s just pure fun as well as a “come as you are and make no apologies for that.” It makes me smile. It makes me feel giddy. It makes me feel free. There is not enough of that in the world today. This question is cruel as there are so many!! I guess mine is not when they’re together but it’s when Wynonna says, “Peacemaker is just a gun; Waverly is Waverly!! !” It just threw in your face what family meant to Wynonna, and that just cut me to the quick. I don’t think it could be anything other than this, a screen grab from a behind the scenes clip taken at ClexaCon, me with two kickass women, all smiles, celebrating just how much this show means to us and being celebrated by the show as to how much we mean to them. How have I not!? But seriously, the best thing I feel like I’ve done is brought the joy of just having fun into the lives of people around me. I’ve taken #WynonnaTravels where I go and just unabashedly taken pictures because IT’S FUN AND I DON’T CARE WHAT YOU THINK! I’ve given away t-shirts to people and tried to #EarpItForward whenever I can. Mentioned Wynonna Earp in a résumé and then submitted that résumé for a job. No, really, I did that. Hmm. I don’t shave as often as I ought to. Also… I think I’m kind of a decent person. And I think he is, too. I’m an 8, but rotated 90 degrees (that’s an infinity symbol, btw). Many thanks to Jill for participating! And we’ll see you next time with an EarperView with another one of my favorite Earpers. Awesome! I loved it. It’s also nice to know that I’m part of an age demographic that loves WE. Can’t wait for the next one! this is awesome! she would love the Echo, since she loves small town police blotters! She really would. I should bring her a copy.